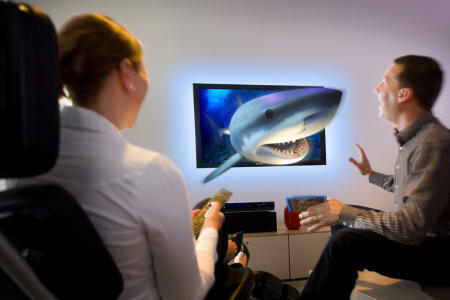 Philips have been showing off their new and amusingly-titled Philips WoWvx technology, which is a 3D TV technology. Before you groan about dodgy looking glasses, Philips’s approach can be used both with and without glasses. It’s what the company’s calling “2D-plus-depth”, meaning it’s not true 3D, but just 2D images with the illusion of depth to create a semi-3D look. Apparently the end result is very effective. Philips are now getting all excited as they’ve managed to put their WoWvx technology onto BluRay, meaning 3D films that are apparently taking off in the cinemas (well, they are according to Philips, anyway!) can now be watched in the home as well. Or at least, they could be if you had a Philips TV with the WoWvx technology in it, as no-one else currently uses it. Actually, not even Philips themselves use it just yet, as it’s so new, but you’ll soon be able to buy 3D displays for “professional use” (i.e. point of sale advertising, gaming systems in casinos, etc.) in 8″, 22″ and 52″ sizes before the end of the year. Philips even have a giant 132″ 3D display that they showed off at IFA 2008 earlier in the year, which means that the technology can scale. No idea whether we’ll see the the Philips WoWvx technology in the home anytime soon, but it’s an interesting development on current HDTV technology. Philips and LG wow the world with portable TVs…wait, what? !